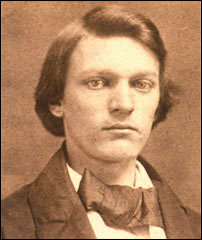 John Augustus Robeling's pioneering genius made the construction of the Brooklyn Bridge possible. 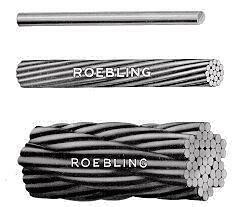 Roebling was born on June 12, 1806 in Germany. After graduating from the Royal Polytechnic Institute in Berlin, Roebling immigrated to the United States in 1830 to pursue a career in engineering. 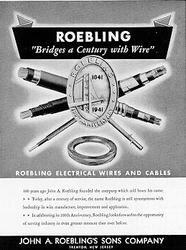 Roebling became one of the leading suspension bridge builders in the U.S.
John Roebling invented a machine to twist steel wire into cable, which proved to be a vital necessity for the suspension bridge structure. 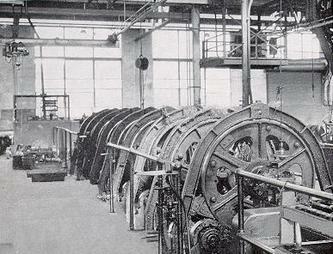 Roebling's machinery to twist steel wire into cable. A 100th Anniversary Roebling Advertisement 1941. 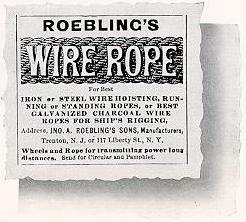 Roebling wire rope advertisement. After successfully completing the Covington and Cincinnati Suspension Bridge over the Ohio River, Roebling envisioned the design for a suspension bridge connecting Manhattan and Brooklyn that he described would be "the perfect equilibrium of nature". In 1866 the New York State Legislature passed a bill granting the bridges construction. Sadly, Just three days after construction began, Roebling's foot was crushed while determining the exact location of the bridge's tower. Suffering from Lockjaw infection, Roebling died 2 weeks later at age 62 on July 22, 1869. John Roebling's son Washington Roebling with help from his wife Emily Roebling continued direct control over the Brooklyn Bridge's construction. It was Washington's innovative idea to use strong caissons as the foundation of the bridge's towers. Unfortunately, Washington grew partially paralyzed, deaf, and began to lose his sight. 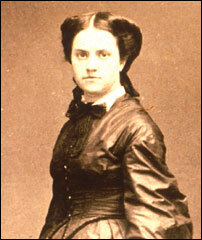 While Washington inspected the construction from his bedroom window, Emily Roebling became the head of the Brooklyn Bridge. Leading the construction of the bridge right through its completion in 1875, Emily became an example of an influential woman in a period when such power was unheard of for women. As seen in the picture to the left, a feeble Washington is overseeing the construction from his bedroom window.